Guadalcanal was a fierce clash of national wills. Bloodied and humiliated by the sneak attack on Pearl Harbor, American armed forces were on the comeback trail less than six months after the debacle. At Guadalcanal, a disease infested island, two superb military organizations met each other for the first time in land combat -- bayonet to bayonet -- in a contest, only one army could win. The United States Marine's were determined to keep their small foothold of Henderson Field and the Japanese were equally determined to drive them into the sea. During the protracted battle that lasted for six months, the struggle to "own" Henderson Field came to a bloody climax on Sunday night 25, October 1942. At Lunga Ridge -- about 1,000 yards south of Henderson Field it was raining torrents, creating miserable, bottomless mud -- typical Guadalcanal weather. The MARINES manning the main l ​ine of defense were exhausted. For two days Japanese human wave assaults had been flung against them. Each time the charging enemy had been driven off -- but the weary MARINES knew their tough adversaries weren't through. The Japanese would gather reinforcements and return. About midnight, from the gloom of ink-black darkness cam hundreds of screaming Japanese troops. Throwing themselves on the flesh-cutting barbed wire, the first of the waves formed human bridges for their comrades to leap across. One of the Marine section leaders facing them was Sergeant "Manila John" Basilone. An experienced machine gunner, Basilone knew his guns would be tested to their mechanical limits. It would be up to him to keep them firing. During the attack when grenades, small arms, and machine guns were ripping the night and exploding human flesh splattered friend and foe, Sergeant Basilone stayed with his malaria-ridden men. Repeatedly repairing guns and changing barrels in almost total darkness, he ran for ammo or steadied his terrified men who were firing full trigger to keep a sheet of white-hot lead pouring into the ranks of the charging Japanese. Bodies piled so high in front of his weapons pits they had to be reset so the barrels could fire over the piles of corpses. Not even the famous water-cooled heavy machine guns could stop all the assaults, and one section of guns were overrun. Two men were killed, three others wounded. Basilone took one of his guns on his back and raced for the breach in the line. Eight Japanese were surprised and killed. The guns were jammed by mud and water and a few yards away the Japanese were forming for another charge. Frantically stripping mud from the ammo belts men fed them into the guns as Basilone cleared jams and sprayed the fiendish troops rushing at his positions with razor sharp bayonets and hands full of grenades. Sometime after 0200 the firing died down. No one relaxed. At 0300, the final remnants of the Sendai Regiments with their officers prepared themselves for a final Banzai charge. 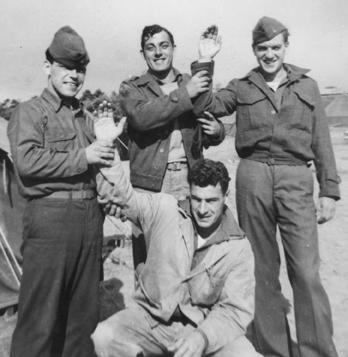 The full weight of the fanatical Japanese seemed to fall on Basilone's men. But he had set up a cross fire that smashed the charge. Dropping to the mud, still screaming Colonel Sendai's remnants crawled forward trying to reach their tormentors. Depressing the muzzles of his weapons -- Basilone destroyed them. Nash Phillips lost a hand fighting next to his Sergeant. He was surprised to see John Basilone appear next to his bed a little while after dawn. "He was barefooted, and his eyes were red as fire. His face was dirty black from gunfire and lack of sleep. His shirt sleeves were rolled up to his shoulders. He had a .45 tucked into the waistband of his trousers. He'd just dropped by to see how I was making out; me and the others in the section. I'll never forget him. He'll never be dead in my mind!" With dawn the battlefield was strewn with dead and wounded Americans and Japanese -- but Henderson Field still belonged to the Americans and its ownership would never be seriously challenged again. At least 38 dead Japanese were credited to Sergeant Basilone -- many were killed with his Colt .45 at almost arms length. 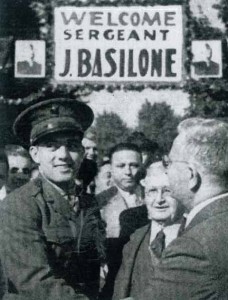 Just 26 years old, Manila John Basilone had entered the ranks of the Marine Corps pantheon of heroes -- and shortly America would take the big, handsome Marine with jug ears and a smile like a neon sign to their hearts. The legend of a "Fighting Sergeant" was born. When the battle was over, and his squad members interviewed, Sergeant Basilone was credited by his men for his will to fight and ability to inspire them in a night of cold fear none ever forgot. Within a short time, the Japanese evacuated Guadalcanal and prepared to meet other Marine invasions of their strongholds elsewhere in the Pacific. American fighting men had proven they could beat the best of the best, the most experienced troops Japan could throw at them. 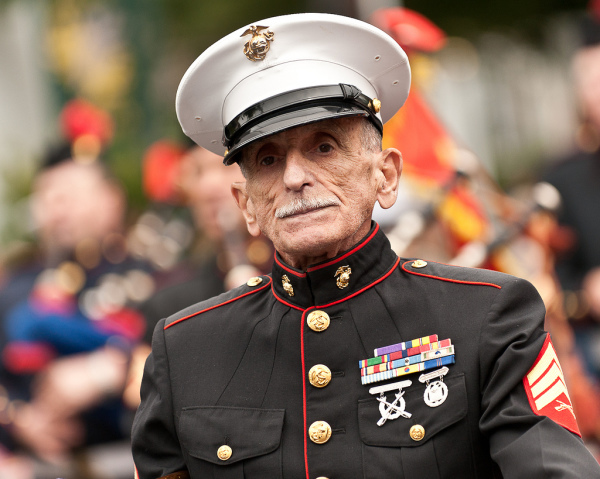 After Guadalcanal, the Japanese high command had a fresh respect for the MARINES. They would be forced to meet time and time again as America pressed across the Pacific toward their homeland. 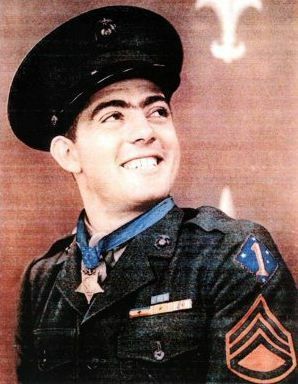 When he received the nation's highest decoration, John Basilone replied modestly, "Only part of this medal belongs to me. Pieces of it belong to the boys who are still on Guadalcanal. It was rough as hell down there." On the 1943 War Bond, Tour Sergeant Basilone was to say, "Doing a 'stateside tour is tougher than fighting Japs." When Gunnery Sergeant John Basilone voluntarily returned to the Pacific war, it would be on the sands of Iwo Jima 19, February 1945. At the head of another machine gun squad, he would drive hundreds of frightened raw troops off the beaches toward their assigned objectives. Iwo would be his toughest fight. Barely on the island two hours, he was killed leading his men.